I was born and raised a Catholic and I've never done what many people are going to do on this Holy Thursday and Good Friday. 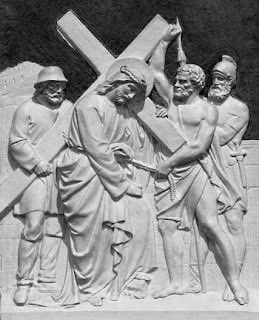 I've never done the Stations of the Cross, which is where you spend time meditating on Jesus' passion and crucifixion. There are typically 14 to 15 "events" or "stations" and you spend time meditating on different them. For example, the first one is "Jesus is condemed by Pilate" and you would normally read a Bible verse, a reflextion and then spend time meditating before moving to the next station. Last week, for the first time in forty years, I did the Stations of the Cross after it was suggested to me by a priest. I didn't do them in the traditional way that you think of. I didn't do them in a church while in front of a statue or an image of the different stations. And I wasn't on my knees nor was I really actying reverant in any particular way. I did the stations of the cross while doing my workout of the day. --I was able to understand what a loving act it was Veronica wiped the face of Jesus as the sweat ran into my face. Now, I'm sure some are shocked and aghast and my perceived irreverence and thinking that I'm comparing my CrossFit workout with what Jesus went through at Calvary. That's not what I'm saying at all. And I'm not saying this is necessarily a good way to do the Stations of the Cross. I'm saying, that I think we take for granted exactly what Jesus went though for us (or at least I do) I'm saying that it was a good excercise for me--physcially and spiritually--because I realized that I had not been betrayed, abandoned, scouraged, beaten and condemned as Jesus had been. I knew that in 30 minutes, I was going to be sipping my protein drink and sitting at home in front of the comptuer. I realized that Jesus did that all for me. I don't think I would have realized that while sitting in a quiet church. I only came to that realizeation by sweating, panting and suffering. What is your expereince with the Stations of the Cross? Are you doing it on this Holy Week? Great job, Jamie! and good way to reflect/meditate, i think. I do the Stations of the Cross every Lent...multiple times. The church is never quiet when I am there because my kids are noisy (haha). I have a friend who has about 7 acres of woods at his house and has built a Chapel and a path where people can walk/pray the Stations of the Cross. We do this at least once every year (matter of fact, my husband and kids will be there tomorrow on Good Friday...I have to work, unfortunately). It's an open invitation (I can send it to you if you like). I really get a lot out of the Stations of the Cross. I need the reminder of everything Jesus went through for us. I also need to watch The Passion of The Christ every Lent, too. That's just me, though. I like how it keeps me focused on the Sacrifice but also the Joy of the Resurrection on Easter.